Cimbclicks, the Lowyat forum and Malaysiakini–come on down and get your prize. These guys scored as high on their SSL security as Google!! So all in all, this was a really good showing. 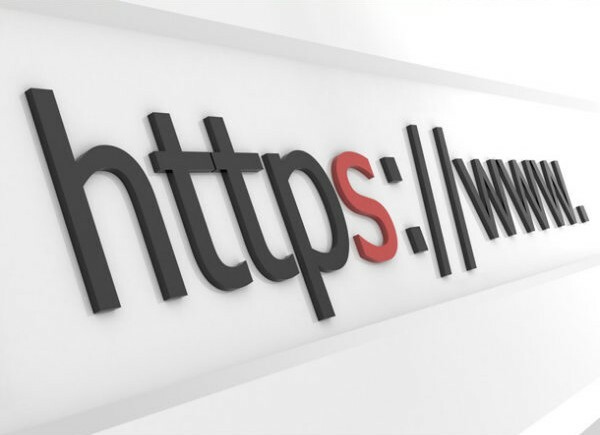 Of course, just because the SSL security is high doesn’t mean the system isn’t vulnerable in some other way–but it does suggest the organization in question is serious about security. These guys do simple things really, the use good certificates, they reject older implementations of SSL and they have sufficiently long key lengths, it represents a good approach to security. These last two criteria are essential, supporting SSL versions of 2.0 and older, or using key lengths of under 128-bit is a sure fire way to fail this test. This is where things get ugly, you would really expect LHDN and Maybank to get their act together. 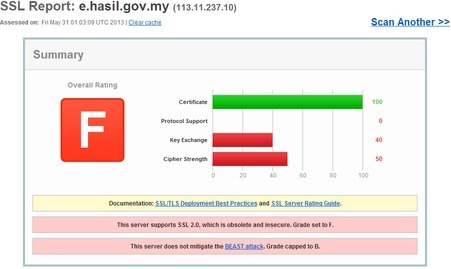 Maybank and LHDN fail by allowing users to use SSL 2.0 (which is considered ‘bad’ or deprecated), as well as utilize key lengths of under 128-bit, which in todays world really isn’t good enough. Sites should start at 128 and go from there if you ask me. [box icon = “chat”]PCIDSS Requirement 4.1 requires the use of strong cryptography and security protocols to safeguard cardholder data during transmission over public networks, namely the Internet. Strong cryptography and security protocols must be deployed and SSL v3.0/TLS v1.0 should be considered the minimum standard. I was surprised as there really is no reason to support SSL v2.0 anymore. Popular web browsers no longer support it. IE7, Chrome, Safari, Firefox and Opera all turn of SSL v2.0 support either completely, or by optional default, so the chances of their being this one user who still uses an old browser accessing the site is minimal at best. Even then it’s probably more advisable to train these users, rather than compromise the security of the entire site for all other users. Now before you panic–most browser protect you to a certain extent, however Banks shouldn’t completely rely on users for their security, and hence this easy-fix should be fixed. Also, I’m not sure if the two-factor picture authentication from Maybank mitigates their support of SSL v2.0, but I don’t think so. Finally, Maybank does offer two-factor authentication via sms for one-time transfer that weren’t previously registered on the portal–but even then….this should be fixed. So let’s put this into perspective. It turns out a public forum runs their website with more security than the Malaysian tax authority and Malaysia’s largest bank. 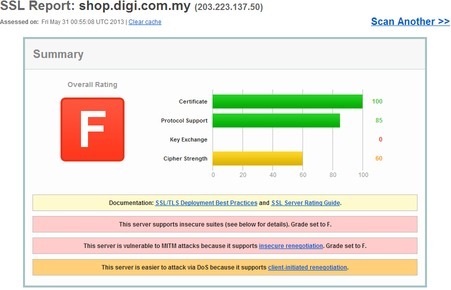 However, I did realize that it probably wasn’t fair on Maxis and Digi to test their store/shop sites, these sites probably don’t require high end security–and even vulnerable SSL implementations would suffice (unless of course the username/password for these stores are the same as their main sites). 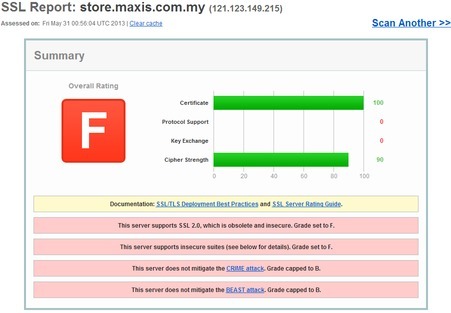 So I re-tested their customer logins to see what kind of security they provided, and lo and behold’ Maxis scored the highest marks I’ve seen on any site in Malaysia (equalling Malaysiakini), while Digi still fails miserably (presumably for their continued acceptance of SSL 2.0). Security is a real hot topic right now, not a day goes by when we don’t see some Fortune 500 company or government agency losing data to attackers, utilizing weak SSL implementations not only paints a big red target on a site–it also suggest a lackadaisical approach to security from the organization in question. It probably isn’t in my best interest to be critical of Digi at this junction, since I’m in the running for their WWWOW awards again–but what the hell, I’ve just gotta be me. What surprised me though is how Maxis has vastly different scores for the moi.maxis.com.my (customer login) and store.maxis.com.my (online store). The differences couldn’t be wider, the moi site actually addresses BEAST attacks, uses secure cipher suites and doesn’t support SSL 2.0. They probably have two different teams looking at these sites–and we all know whose the more secure one.